My daughter was scheduled to swim in a tune up meet for her regionals (STCAA) when her coach asked me if I would like to compete in the 200 meter freestyle event for seniors (not as in senior citizen I'm too young for that). I promised him if I wouldn't get injured (as if I didn't have enough of it) in the February 5 Subic Triathlon I would definitely join. When that day came I found out that I was set for the final event in the afternoon, I hate waiting games, so I decided to leave my daughter and go for a 55K bike ride before my 200 meter stint. 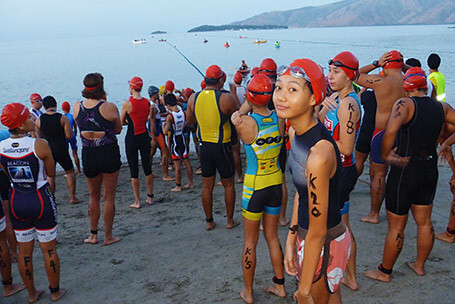 I got back just in time and as we were waiting at the briefing area I was surprised to learn that all of us were going to start from one and the same lane and zigzag to the adjacent lane after touching the end of each 50 meters just like an aquathlon without the run. There were only 11 of us yet the organizer chose to send us off in pairs. 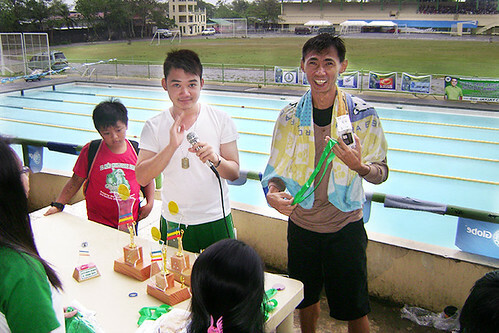 Without diving I finished with a time of 3:15 and on that day it was good enough for a gold medal plus a cellphone, yey! WORKOUT DIARY. 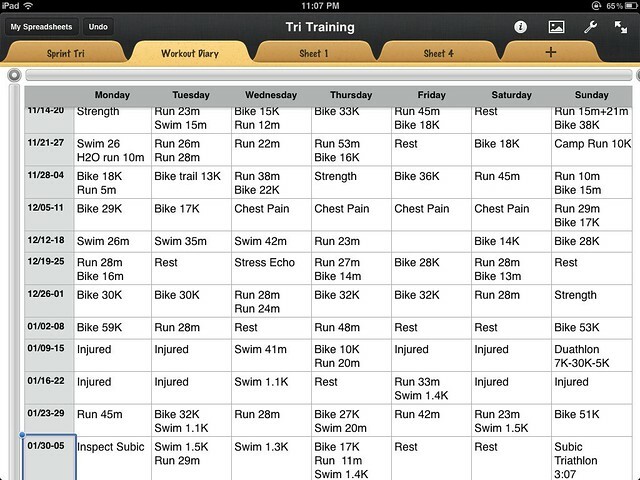 I use my iPad to log my training and from this I gain confidence just by monitoring my progress with a particular schedule of workout. Some stuffs work and others simply don't and with a diary like this I can easily guess which ones to eliminate. There is a revised edition that includes weekly total mileage. 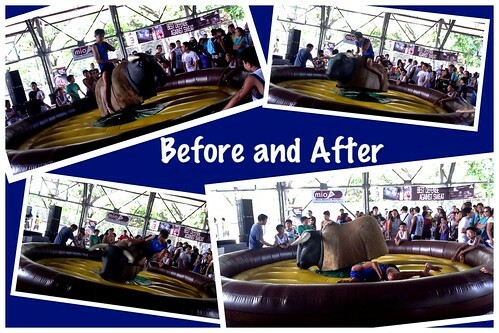 When I joined the Ateneo Aquathlon 2012 I also participated in their bull riding contest. The longest time to beat was 1 minute 31 seconds. I never managed to get close to his time. The winner got a brand new cellphone. Yey! And I got battle scars ouch! 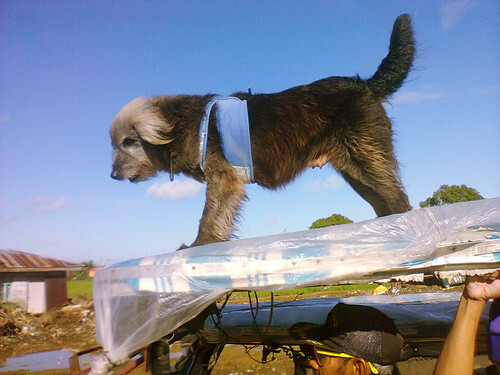 - Be prepared for unpredictable weather conditions; hot and humid, or windy and/or rainy. - Racers will be sent off with a mass start. - The first leg will consist of 2 loops while the second leg will only be 1 loop. 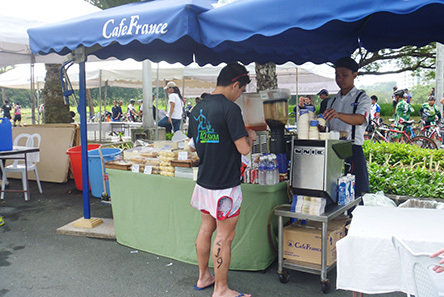 - There are water stations situated along the course and 1 water station at the transition area. - The course is relatively rolling with tight corners. Whether you are an experienced or a beginner racer, it would be wise to slow down when cornering. - This is a drafting race. We would like to emphasize that everyone take necessary precautions when riding in a group, especially if you're using aerobars. Always be aware of surroundings and the people around you. If you are not used to riding in a group, it would be best to avoid it and ride at your own pace. 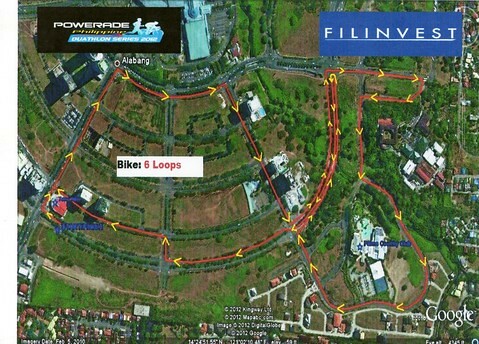 - The bike leg will consist of 6 loops; it is your duty as a racer to keep track of your loops! - Water station in the transition area only, none along the course. Bring water bottles for hydration. 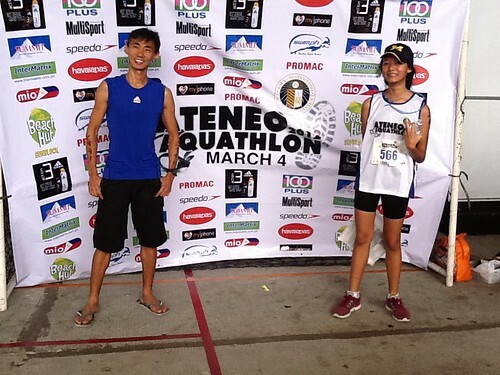 It was almost a year ago when my daughter first joined an aquathlon event. And here I am following in her footsteps har har! I was a decent swimmer in my elementary days but that was 30 years ago. Right now I'm too lazy to get back into shape but one thing I've learned is that technique or lack thereof never go away easily. As far as running is concerned I started jogging on November, 2011 and although I didn't run far and fast, my 25 minute run plan seemed to work for me. 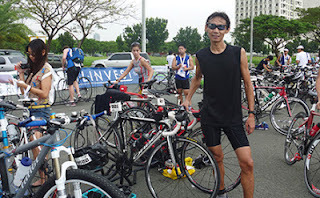 I signed up for Ateneo Aquathlon to accompany my daughter Camille. 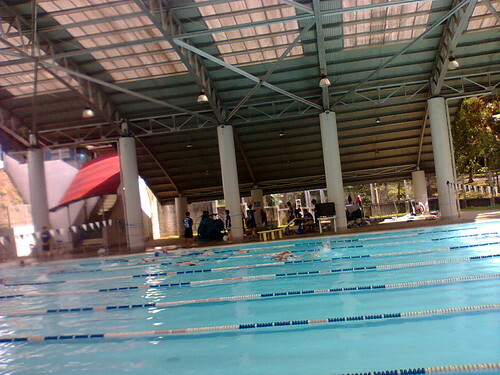 The assembly place where we got our race packets and body marking was at the covered courts of Ateneo Loyola Schools right beside the covered swimming pool. 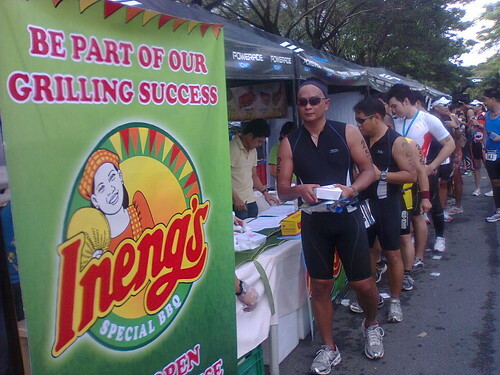 Food stands like Yellow Cab Pizza were located at one corner and sponosor's booths lined up along them. The FAST Ateneo Swim Team put a mechanical bull for a rodeo contest at the center of the court, my first time to see one :P. The stage,the computers, and the finish line were also in the covered courts. 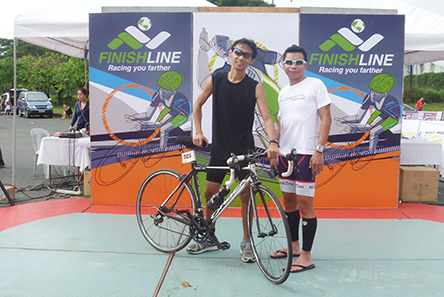 The race was pegged at 600 meter swim plus 5 kilometer run. 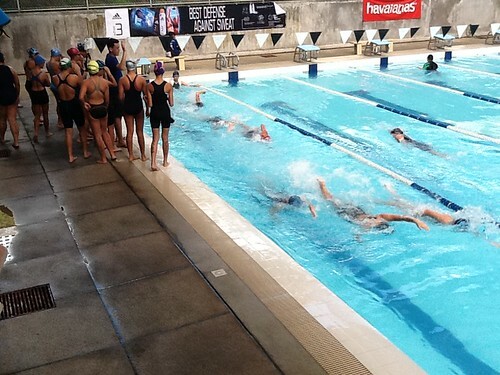 A loop in the pool equals 200m so we have to do it three times and the run was an easy 5k course. 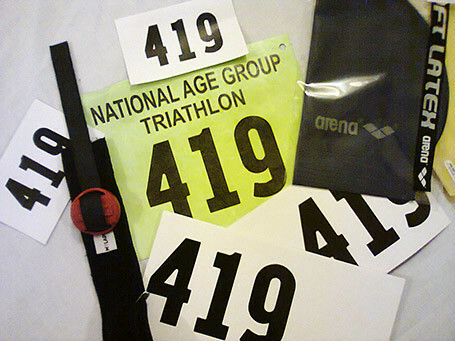 I was in wave 3 of my age group. The time gap was short and I wasn't prepared when it started, I was still putting my cap and goggles and trying to see if my stopwatch had started. My apologies to the guys on my back for being a human barricade at the start. I overtook a lot of racers from my wave on the first loop and after the third loop I was able to overtake some more from the first wave. It was hard coming from the last wave as I find it quite difficult to pass. Swimming was over in just over 12 minutes and transition took a little bit more than a minute. Oh yes! I was getting better in transition. I was about to take it hard and fast on the run but mr. side stitch prevented me from doing so. 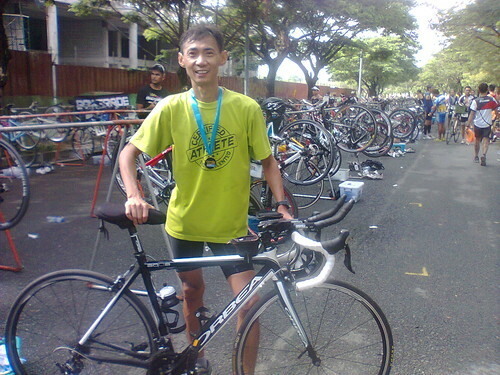 I managed to clock a 25 minute 5k for a total of 38 minutes on my first aquathlon, a distant 10th out of 39 athletes. Wow I never thought the word 'athletes' would sound that cool. Then back to the mechanical bull, I couldn't resist the temptation to ride even if my wife and daughter objected to the idea. They were calling for a last contender when I came forward and raised my hand. The time to beat was 1 min. 31 sec., I never came close and worse I got nasty wounds on my left knee from riding too tight to the bull. The amateur organizers were great. At 500 Php entry fee it's just too good to be rare. 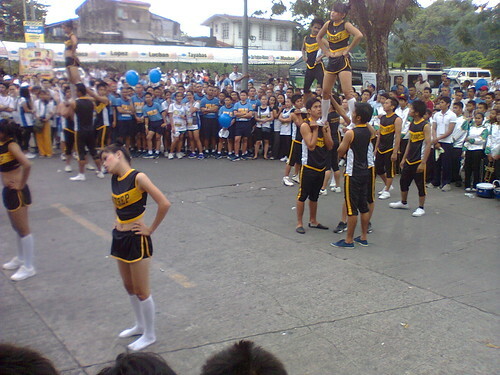 Assembly at Patio Rizal in Lucban, Quezon. 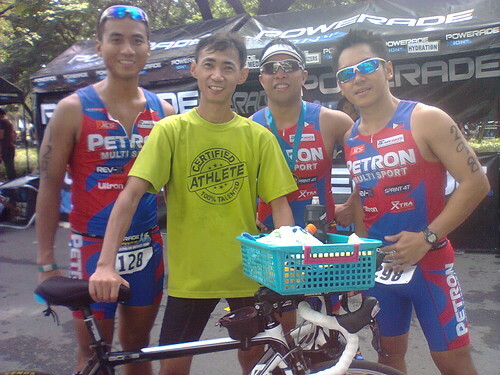 The first leg of the National Age Group Triathlon kicked off at Subic Bay Freeport on February 5, 2012. 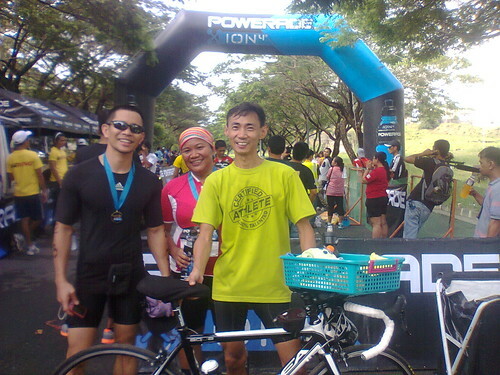 It was my first standard distance race (1.5k swim, 40k bike and 10k run) and first open water swim. 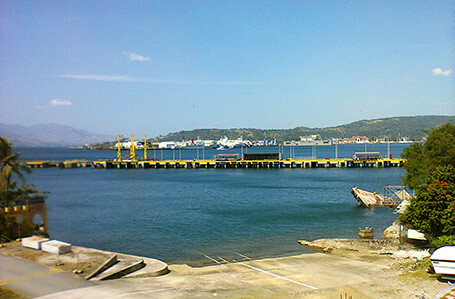 I felt a bunch of nerves when I saw the gorgeous swim venue the day before the race. My driver said 'a a bossing ang layo, lalanguyin mo po ba yan?' 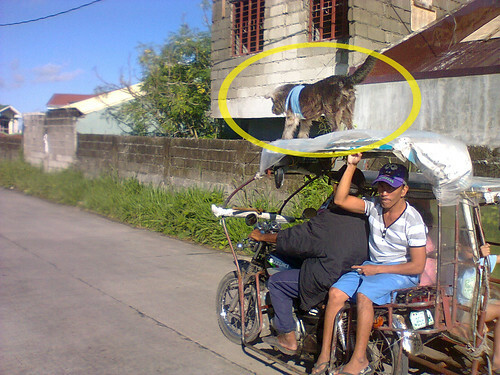 and I told him 'oo dalawang beses nga eh'. It was a 750 meter loop so we have to swim it twice. 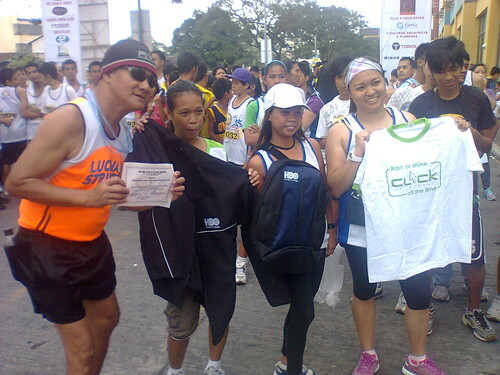 At about 4 pm that Saturday afternoon I along with my daughter and nephew who will also race in the mini sprint category went to Subic International Hotel to get our race packets. Then my daughter wanted to have a bike ride so we went back to our hotel and hopped on our bikes to have a short 8k ride. After that I knew that she can finish her race despite her lack of bike training. On race day we got to Dungaree Beach before 5am, proceeded to body marking and checked our bikes in the transition area. The place was too dark except for the transition area. After sticking my number to the bike I checked the timing chip on my ankle and heard my girl calling for my help. She can't find her race number so we searched frantically for my driver and eventually found it inside the car. I heard the organizer blurted out on the microphone that they were waiting for sunrise before they could start the race. My daughter and nephew belonged to the first wave and male age groupers like me were on the last wave. 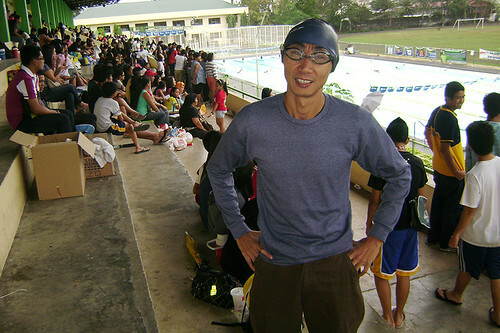 I was hesitant to start in front so I joined my buddy at the back and let a hundred men swim first before taking the plunge. It was a big mistake as overtaking in the water would take a toll in my pacing strategy. Anyway it was over in about 30 minutes and I was off to the transition area. They provided a fresh water shower along the path to the bikes and I just took a quick wash of my hair. Without having a trisuit it was a disaster in T1. The water bottle that i was about to use to clean my feet were still sealed. I put on my shoes before my cycling shorts, it was too tight and I almost fell. I forgot to put on my number belt and the whole thing felt simply too long. The 40k bike route was awesome. 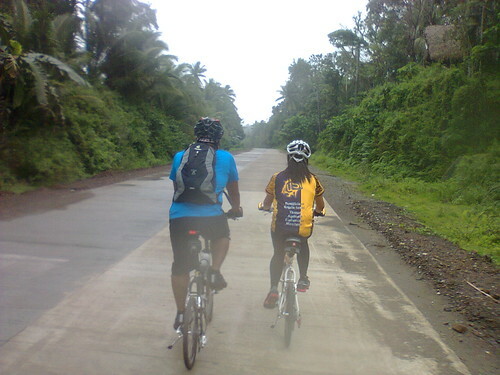 The first few kilometers brought us to the jungle like hills of Subic and after that we're coasting along the seaside highway. It was 2 loops of 20k each. My wife and mom got the chance to see me in action as I pass by our hotel. Unfortunately I was among the slowest riders out there and as I pedaled hard and enjoyed the scenery, I watched a lot of triathletes pass me by. With an average speed of 27.1 kph my bike ride was over at exactly 1:28:33. I was already wearing my New Balance running shoes during the bike leg so it didn't took me long before I started running. Holding on to my cellphone and water bottle I started the run by the seawall with a moderate pace. At approximately 2 kilometers out my legs were already hurting from the side. The dreaded brick effect from coming off a vigorous bike ride punished both of my legs. 'Laspag sa bike' was what they said about my trauma. I was expecting a 55 minute run split but could only muster 1:03. Still, I felt pretty much lucky to finish the race intact, no accidents and no jellyfish stings. My nephew finished third in his category, my daughter ...well let's just say she finished strong and as for me with a total time of 3:08 I came in 20th out of 26 triathletes in my age group. I guess it's not a good finish time but the experience was really great, the venue was fantastic and the post race brunch was superb. Race happy triathletes... or not! 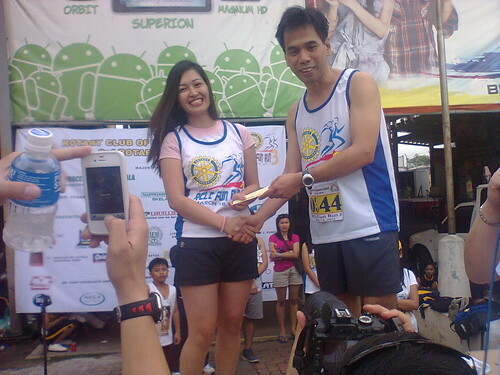 Sunday, January 15, 2012, 6:30am at Filinvest Corporate City, Alabang, Muntinlupa City. Good weather and controlled traffic made for a very nice premise to a race. There were two categories in this duathlon event; the Sprint and the Mini Sprint. 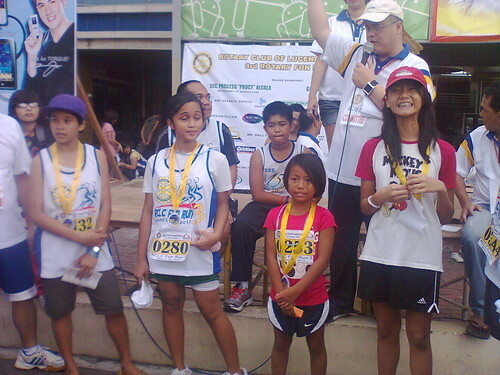 The Mini Sprint was pegged at 3k - 20k - 3k. I joined the longer Sprint distance which for some reason turned out to be 7k - 30k - 5k. 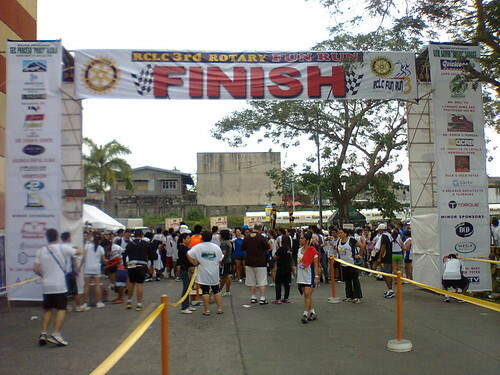 It was December 18, 2011 when the organizer conducted a race track trial for would-be-participants who would like to track read the race route. 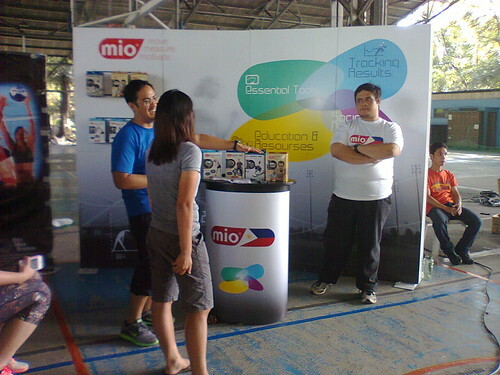 I went there and the organizer Mr. Vince gladly accommodated me. 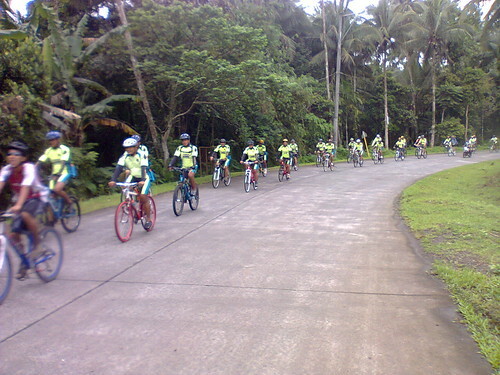 We went through the bike route and saw some riders of Team Beacon and practiced with them. I registered at a cost of 1,350 pesos plus 400 pesos for the timing chip and strap which can be used in their other events. Processing during race day was a breeze but there were some participants without designated bike racks that I saw complaining to the race marshals. Gunstart at exactly 6:30am. I started slowly for the first hundred meters then slowly built up my pace as my body warmed up. There were no distance markings and no hydration stations along the first run route and the marshals had not done a proper job of pointing us to where we should turn. 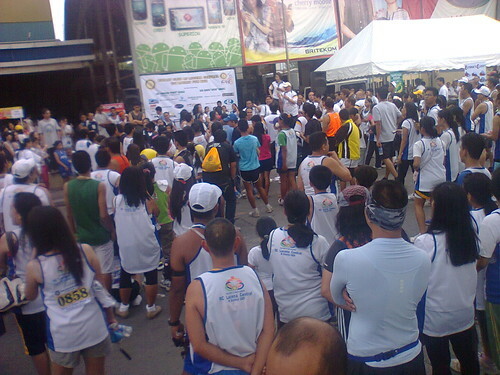 The fastest runner got lost and we all followed him and what was billed as a 5k run became 7k. I got to transition area after 34 minutes and changed my shirt before starting the bike leg. 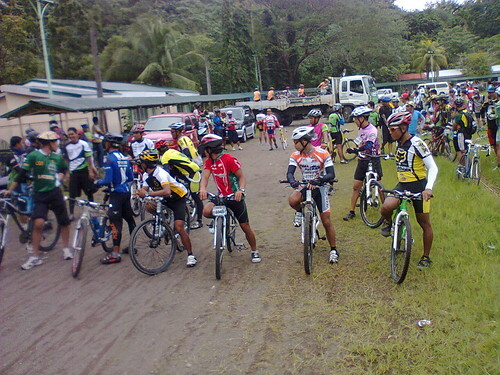 The bike route was a technical one with so many turns and some hill climbs on asphalt road. 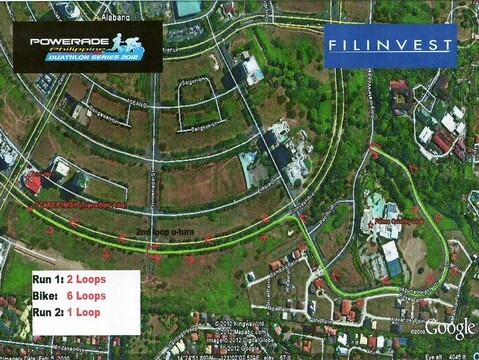 6 loops of 5 kilometers each loop was required for the Sprint category. 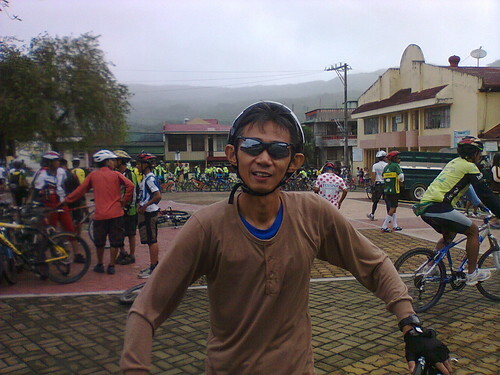 I consumed a pandesal and some Jelly Belly Sport Beans along with a bottle of gatorade during the ride which took me an hour and eight minutes to complete. 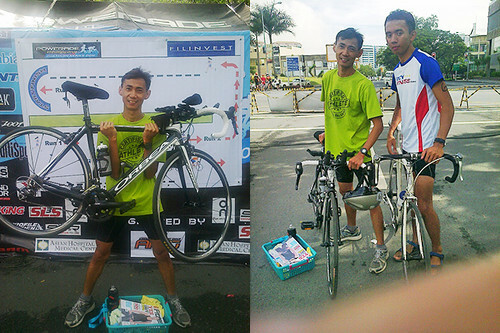 After racking up my bike on the transition area, I changed my shirt again and proceeded to run slowly. After approximately running for 2.5k my left leg started to hurt. The feeling was a sharp pain running from the left side of my leg going down to the left side of my foreleg. It forced me to slow my pace even further and walk as I could no longer endure the pain. At about 500 meters before crossing the finish line I saw a female participant closing in on me and somehow it made me decide to run again despite the pain. 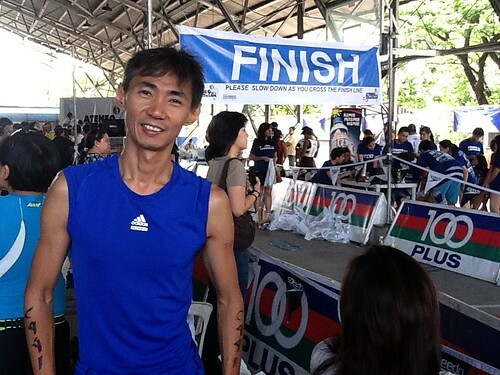 I crossed the finish line at the 2 hour 17 minute mark. Waiting at the finish line was a lady in white giving out finisher's medal. 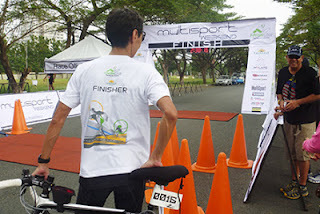 After the race I went to claim my finisher's T-shirt then my daughter took pictures of me. 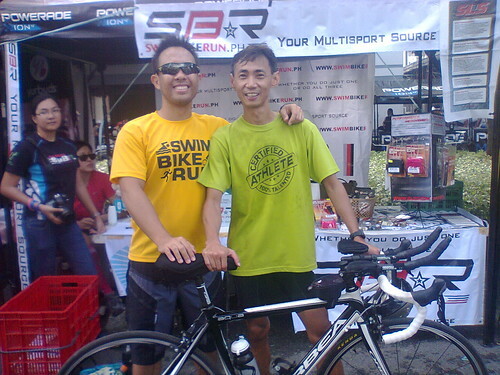 I ran into my old buddy from my collage days at DLSU, and got a lot of tips regarding triathlon from him. 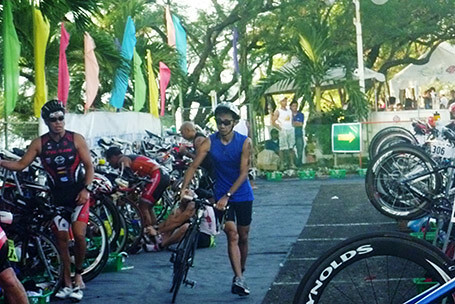 It was my first duathlon event and served as a confidence boosting prep for my next race: the first leg of National Age Group Triathlon in Subic. 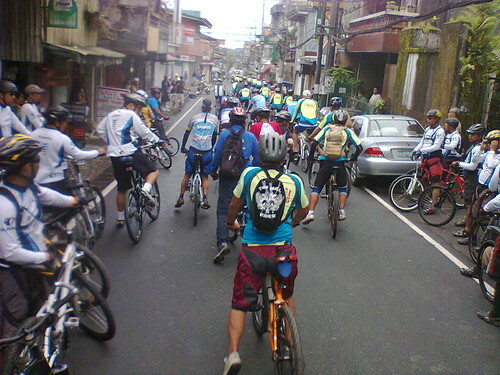 On October 30, 2011 I was invited by my brother to join him in a bike ride organized by the Order of Demolay Kalilayan Chapter. At first I was hesitant because I had just been under the weather a week ago but my curiosity got the better of me since I have never joined a large group ride before. I ride mostly with my two buddies or with my bro, sometimes just alone. Meeting place was at the Pacific Mall in Lucena City. We went there at around 5:30 am. 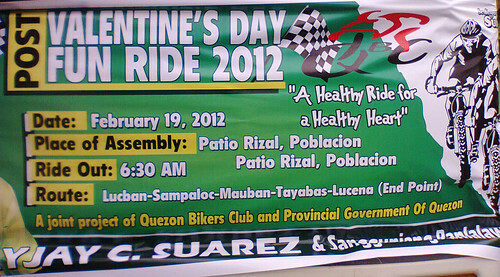 Registration was 150 pesos and for that I received a rider number and a meal stub. 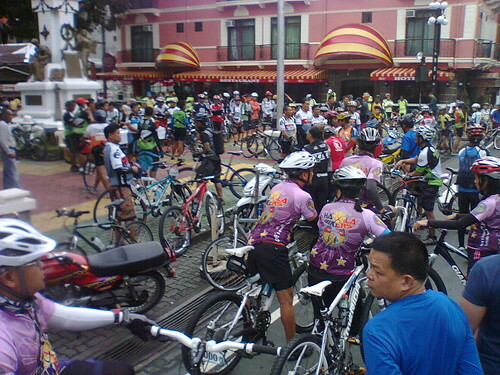 I got to chat with veteran riders and saw some cycling clubs that frequent the roads in and around Lucena City. Waiting for the start got me hungry so I decided to leave and was able to buy hot pandesal at my favorite bakery just a short bike ride away from Pacific Mall. When I got back to the starting line the organizers told us to get into formation and just follow the police escorts. I went to the front of the pack before the motorcycle escorts started traveling. Then they moved and so the rest of us followed, all of the approximately 250 mountain bikers that showed support for the event. 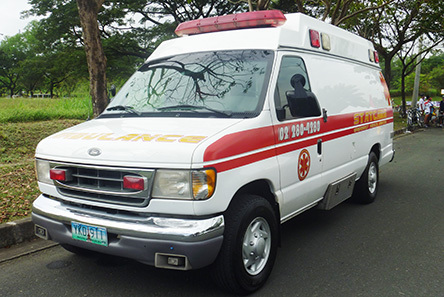 We headed north towards Sariaya, Quezon where we had our first stop. It was an uphill climb on paved road. I was surprised that they distributed 'merienda' and water during the stop at Sariaya's municipal hall. So as of now it's 150 for the ride, the number, the lunch meal stub and this merienda. Burppp. Hmm.. I wonder if there's a raffle draw. 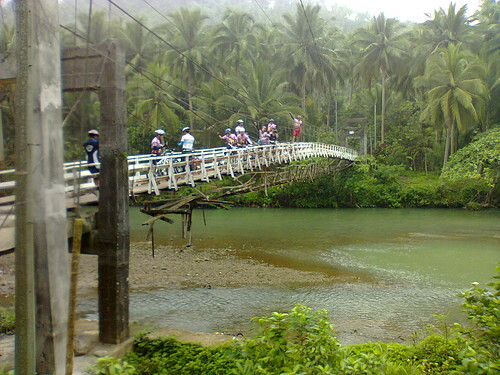 Anyway, after the burp and the gulp we headed down to a rough road going to the shorelines of Tayabas Bay via Barangay Tumbaga. 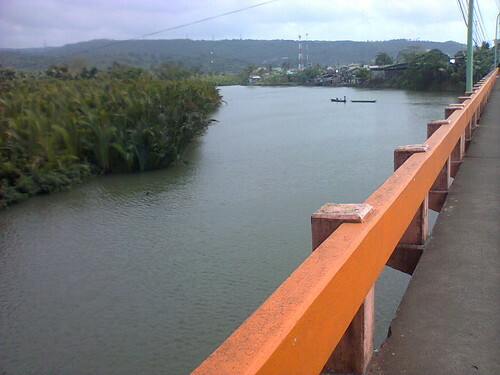 But just a few kilometers away and still far from the sea we turned left and worked our way back to Lucena City via Barangay Ibabang Talim. We passed through coconut plantations and rice fields and took a group pic on a spillway with an old train bridge as a background. 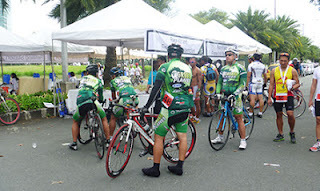 After that I bolted from my group and pedalled hard back to the starting line which was about 14 kilometers away. 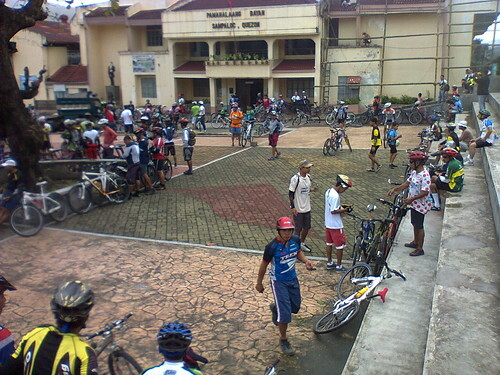 There were already a dozen riders eating their lunch at the covered ground near the start. After finishing my lunch and 'kumustahan' with my friends who also rode, I went home and completed a 42 K ride to start my off season training. And yes, there was a raffle draw and I missed it.